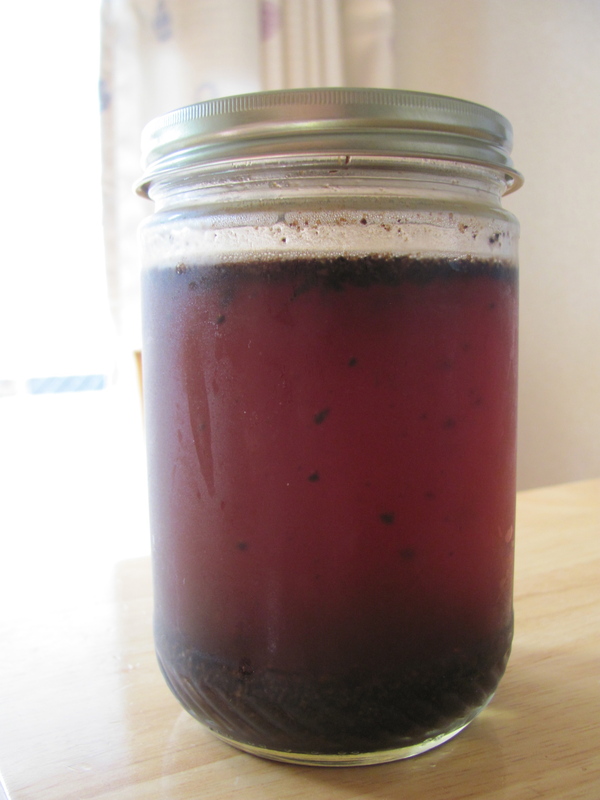 Overnight Cold-Brewed Coffee – I'll Make It Myself! Now that we’ve got our summer breakfast situation sorted with overnight oats, let’s move on to that other temperature-challenged staple of breakfast: coffee. I know that hot drinks can help you cool down, but when the mere thought of pouring boiling water from my electric kettle to my French press makes me break out in a sweat, it’s time to go setsuden on my love of coffee, too. Now, I could just pop over to the conbini to get a can or bottle of cold coffee, but then I would be creating more recycling waste–plus, I take my coffee with milk and no sugar, which isn’t so popular with canned coffee. (My theory is that the added sugar covers up the taste. Bleh.) I could take my travel mug and go to Starbucks or Doutor on my way to work to solve the environmental waste and sugar issues, but then I’m out at least 350 yen for a drink when I could pay about 400-500 yen for a 100 grams of coffee beans that will produce at least 2 weeks of coffee for two. 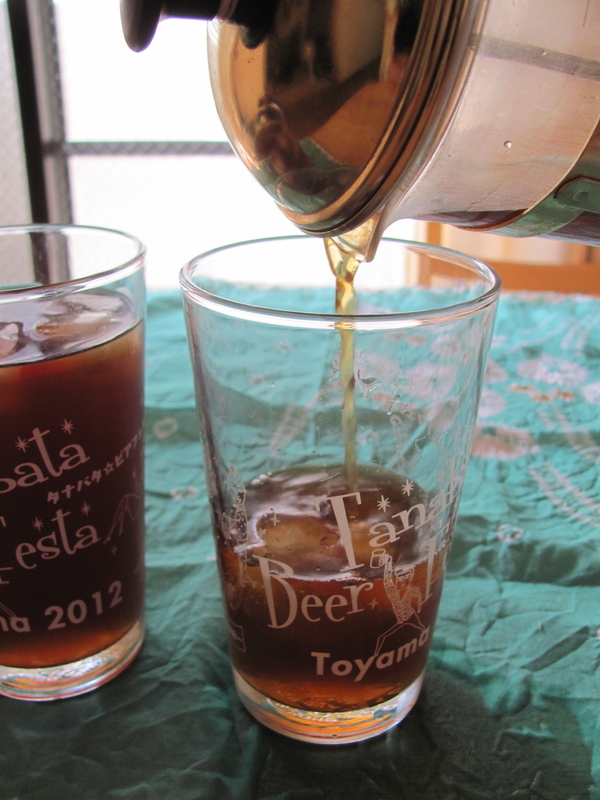 Instead, we brew cold coffee at home starting in mid-summer. 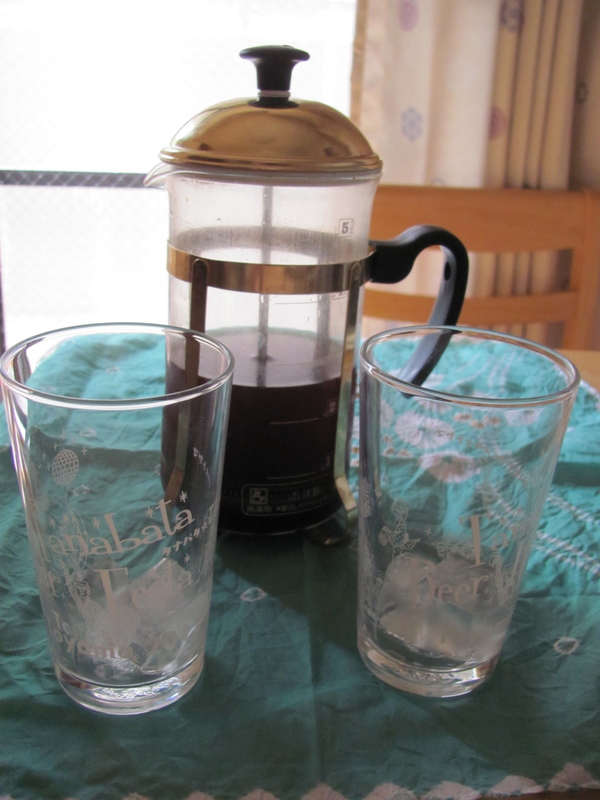 There are two ways to do this — cold-brewing, which I learned from Smitten Kitchen, and Japanese-style iced coffee-brewing, a.k.a. pour-over coffee, which my husband* found on Howcast. Each has its merits: cold-brewing requires slightly less equipment and no hot water; although brewing pour-over coffee requires hot water even if it’s iced, you can make it in what is essentially a beaker, and that makes you look like a badass. Science! Pour-over coffee and coffee in Japan deserve their own posts, so let’s focus on heatless coffee. Cold-brew coffee is something you can make anywhere in the world as long as you have clean water, medium- to coarsely-ground coffee**, a couple jars or pitchers (or bowls), and some kind of strainer: a French press, a mesh strainer, a coffee filter. I prefer my French press because it requires no filter (and thus, no extra waste), but use what you have for coffee-making. I like to make a double batch because, despite what my houseguests would have you believe, I want to spend as little time as possible cooking my breakfast on weekdays, especially in the summer. Cold coffee, cold oatmeal, both overnight: that’s a surefire way to make your morning more pleasant this summer. 1. Mix water and ground coffee in one of the jars. Seal and let sit overnight (or 8-12 hours) at room temperature. 2. Strain the coffee. Depending on what type of strainer you are using, you may have to strain the coffee twice. One time is fine for French presses, I think, and you can pour the strained coffee straight into the cup. If you strain twice, use the second jar as a receptacle. 3. Fill glasses with ice and pour coffee over the ice. 4. Add milk, cold water, or sweetener (a simple syrup or gum syrup mixes better for iced coffee than straight sugar) to taste. 5. If necessary, store remainder of coffee in the refrigerator. *Let me tell you a secret, readers. Whenever I type the words my husband, I hear them in my head the way Dan Savage says that phrase when he talks about Terry on The Savage Lovecast: my hhhuzzzban’. So when you read anything having to do with my hhhuzzzban’, please imagine Dan Savage saying it. **I have my own coffee grinder (kôhî miru, コーヒーミル). My first grinder was a blender attachment, but when I upgraded my blender, I bought a manual grinder from Kaldi Coffee. The Porlex coffee mill (ポーレックス コー ーミル) is usually less expensive than the wooden mill type but portable and very durable. Also, if you want a coffee seller to give you whole beans, just ask for it mame no mama de (豆のままで). *** A cone coffee filter (ensuikei kôhî firutâ, 円錐形コーヒーフィルター) is good for straining cold-brew coffee and making pour-over coffee. You can even get reusable filters! Derek and I have totally become obsessed with cold brew coffee this summer. It is such a delicious treat. I have heard that it can be be heated up, if you want to transform it into warm coffee (and then just have cold coffee in the fridge you can warm up any time). Awesome to see you and Brian enjoying too! Testing out the recipe right now. Sounds good, except 470 mL is not 3 cups. It’s closer to 2, or according to Google, 1.99 cups :) I also weighed out 55 grams of coffee, and it was much more than 2/3 cup. Closer to 1 1/2 cups, with slight +/-, depending on how you grind your coffee. Thanks for catching that! I fixed the water (way to proofread, me, forgetting to double that…), but I’m going to have to reweigh my coffee to double check. According to this chart my original number seems okay, but while I’m checking into this, I’ve changed it to a volume measurement. You want coarsely grind for this since it’s easier to strain out. Update: remeasured the weight of the ground coffee for 2/3 US cup–I got 60 g on a coarse grind. I’ll mention this may vary. Thanks again for your helpful comment and for reading. How’d the coffee turn out?